Bill Cox, THE TRIAL OF BRUNO RICHARD HAUPTMANN (pts 1 & 2), Conqueror 78, 3454! RARE Conqueror issue of Bill Cox's "The Trial of Bruno Richard Hauptmann!" This two part recording from guitarist Cox described the murder trial of Hauptmann, who was accused of kidnapping the Lindberg Baby! With harmonica as well. This original 1935 pressing is in EXCELLENT condition, and it is quite Rare to find it at this level! 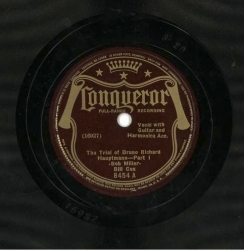 78 rpm, Conqueror 8454.